Collaboration between the Cantieri Navali del Golfo and Speedo Ltd has resulted in the Italcraft 95' project, a maxi open over 24 metres in length. Gianluca Caputi, responsible for the interiors and the external lines of this new Italcraft, based his design on a desire to create a yacht with fairly open plan interiors, full of natural light and not simply a motor yacht without a flying bridge. This has been achieved by giving the Italcraft 95' spacious living areas, wonderfully illuminated by natural light thanks to the large windows around the deckhouse, both along the sides and on top. 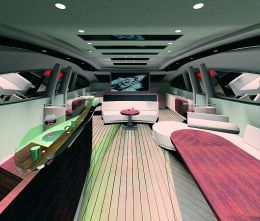 The main deck offers a roomy lounge with cocktail-galley area, lit up, as said previously by large side windows, with transparent panels in the ceiling and sliding roof. Thanks to the solutions adopted on the 95'Speedo Surfrunner, such as a hard top and glass doors to stern with lateral sliding doors, the inside area of the deckhouse can quickly be turned from a closed sheltered area into an open-air terrace with sea view. The main deck also offers a service bathroom, a rarity on this kind of boat. Outside we find three large sundecks, two astern and one in the bows, a platform astern that can be accessed using the two handy side stairways, giving access to the tender hangar. Going down onto the lower deck we have four double cabins for the owner and his guests, two reserved for the crew, a leisure room with entertainment accessories and a spacious separate galley. Obviously each cabin has its own private bathroom. The technical solutions adopted during construction of this 95' are based on an existing, tried and tested technological package. The bottom, structure and installations, in fact, are taken from the Coast Guard Class Corrubbia used by the Italian Financial Police, another boat built by the Cantieri Navali del Golfo, productive in the design of units for military use. Official performance declared by the boatyard is no less than 43 knots for maximum speed, made possible thanks to powerful MTU engines and Arneson Drive ASD 16 Navy propulsion. This Gaeta based yard can also supply a more traditional shaft driven propulsion version for those who are not speed freaks, with a lower maximum speed of 36 knots. 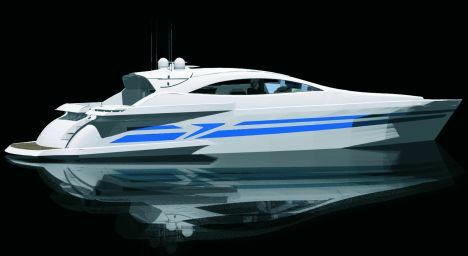 For further information: Cantieri Navali del Golfo - Italcraft; Lungomare Caboto 7; 04024 Gaeta (LT); tel. +39 0771 71281; fax +39 0771 310069; website www.italcraft.it; e mail infocantieri@cantieridelgolfo.it.